Over the weekend, President-elect Donald Trump tweeted about voter fraud, claiming that "millions of people" voted illegally in November's presidential election. Despite Trump's declarations, no evidence of widespread voter fraud has been made public, and experts have said that such fraud simply doesn't occur. At the rate that Trump tweets, it didn't take long for his tweets about voter fraud to be buried at the bottom of his followers' feeds, but not everyone was quick to brush them off: Vermont Sen. Bernie Sanders responded to Trump's tweets with some bold language of his own, calling the president-elect's message "delusional" and "totally insane." Appearing on Conan on Tuesday, Sanders wagged his finger at Trump's tweets — in pretty much the same fashion you'd wag your finger at Trump if you could pull off the finger-wag as well as Sanders. It's his signature move. As show host Conan O'Brien asked Sanders about Trump's recent tweets, the independent senator didn't hold back, particularly when it came to Trump's allegations of voter fraud. First of all, it's delusional. It's totally insane. Nobody believes that who studies elections or election patterns. But number two, this is what is scary about it. When he says that, he’s really sending a signal to Republicans all over the country – Republican leaders – and what he’s saying is we have got to suppress the vote. Sanders also criticized Trump for tweeting on Tuesday about punishing Americans who burn a flag. Trump suggested "loss of citizenship" or a "year in jail" as potential punishments for such an act, but Sanders wanted him to be leading a different conversation entirely. Let's see: We have massive income and wealth inequality; we have 43 million people living in poverty; we have to deal with climate change, which is threatening the existence of the planet; and he's talking about three people who might burn the American flag. Sanders has spoken out against Trump many times before, which makes sense given their opposing campaign platforms. Even in his response to Trump's election victory, Sanders expressed caution. 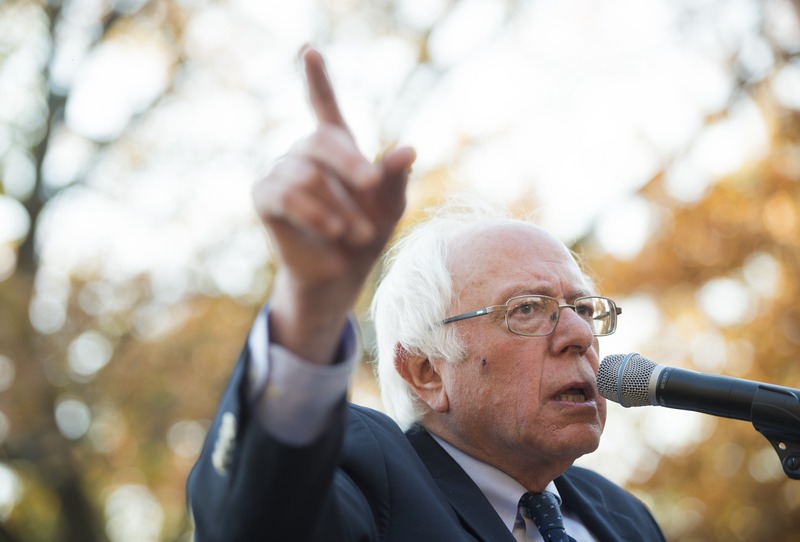 "To the degree that he pursues racist, sexist, xenophobic and anti-environment policies, we will vigorously oppose him," Sanders said of his alignment with Democratic members of Congress. Now, Sanders has taken an even blunter stance. His repose to Trump's recent tweets seems to signal even less urgency to work with Trump when his new administration takes over in January — but that's exactly what he'll have to do. If you tend to agree with Sanders and his finger-wag, just be thankful you don't actually have to work with Trump come 2017.